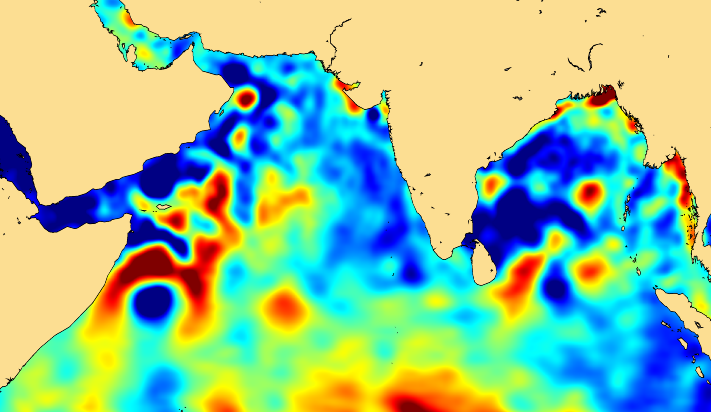 Animation with maps of Sea Level Anomalies (in cm) between 2012/05/01 and 2012/09/29 over the Indian Ocean (merged Delayed-Time Duacs data). Monsoon is one of the major climatic features on Earth, vital for people living under its influences. Studying its cycle and predicting its shifts is of enormous benefit because of their dramatic environmental and societal impacts when floods and droughts occur. Altimetry data able us to study oceanic currents and their variations. By using them in coupled ocean-atmosphere forecasting models, they could help estimate the next monsoon.